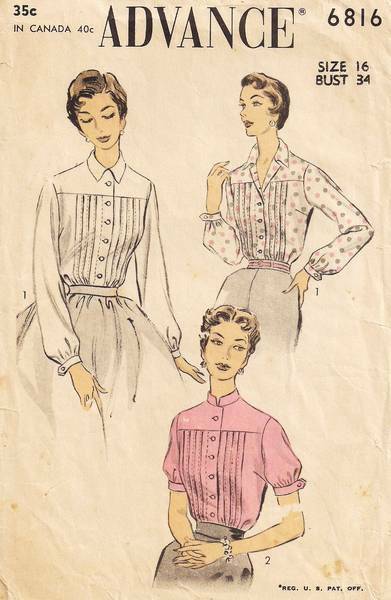 A shirtwaist blouse with a front yoke has a tucked shirt front with convertible collar. Long or short set-in sleeves are gathered to buttoned, pointed bands. Either version to be worn with suits or separate. Pattern is used and complete. The pattern pieces do not have printing and they are factory precut to size and perforated for identification. Clean tear, several inches long, on the sleeve piece. Envelope is complete but aged with wear/tear to edges. Original sales receipt, dated 1956, is included.